One of my New Year's Resolutions, for the second year running, is to add more avocado to my life. I love in it guacamole. I love it filled with corn and black bean salsa. I love it smashed with some salt, spread on toast, and eaten with an over easy egg. I got that idea off a BBC show about astronomy and the SOFIA project where I saw some German astronomers--working on the Very Large Telescope--who who were being interviewed over breakfast high up in the Atacama desert in Northern Chile. One astronomer was smashing an avocado with his toast and egg. Try it--it's delicious. Avocado is just delightful--and no, I'm not being paid to say it. It's a New Year's Resolution that I'm able to keep, which is the best kind of resolution. Brighten up a mashed avocado with a splash of lemon, add the salty tang of feta cheese, make it even creamier with yogurt, and you've got yourself a real winner. This is the first of two avocado dips I'm sharing this spring. My second is Avocado Feta Hummus. 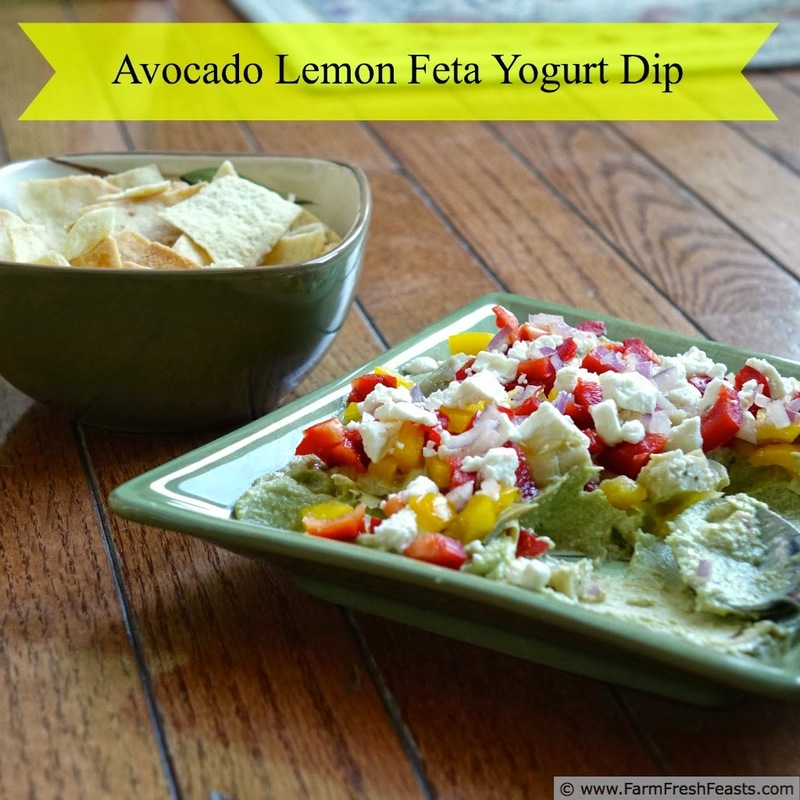 Both use the delightful combination of avocado and feta, first brought to my attention with Maria's Avocado Feta Dip and cemented into my palate with my Slow Cooker Greek Chicken Tacos and Five Layer Mediterranean Chicken Dip. I like to serve these dips piled with vegetables and sprinkled with additional feta cheese, and we scoop them up with carrot slices, celery sticks, fingers, or pita chips. 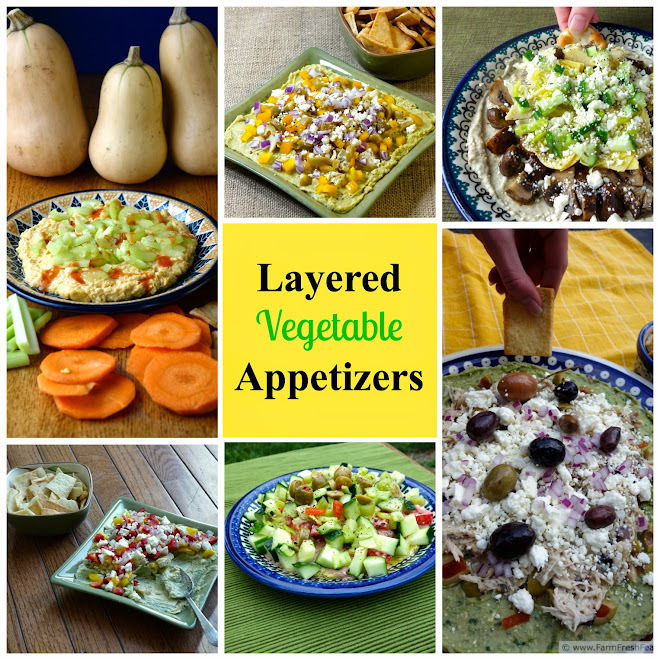 I stumbled across this concept last summer, making my supper out of a Layered Vegetable Appetizer, and refined it during January's #AppetizerWeek when I made a week's worth of vegetable appetizers with a talented group of food bloggers. You can see all our creations on the #AppetizerWeek Pinterest board. Not into avocado + feta? How about queso? 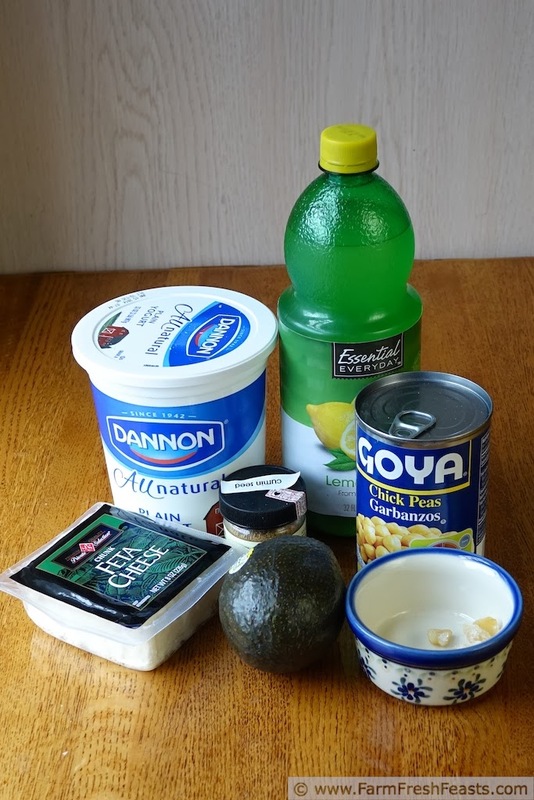 You can find my Avocado Queso Dip here. We've had a string of sunny days, which gives me hope that this winter will come to a close. Amazing how wonderful time spent in a sunbeam can feel. I think our dogs have it right--follow the path of the sun from East-facing windows to West-facing windows over the course of the day. [That's when they're not napping on the heat vents.] This dip makes me think that Spring is right around the corner which, looking at the calendar, it is. Hooray! For more recipes with avocados, please see my Avocado Recipes Collection. It's part of the Visual Recipe Index by Ingredient, a resource for folks like me eating from the farm share, the farmer's market, the garden, the neighbor's garden, and great deals on ugly produce at the grocery store. 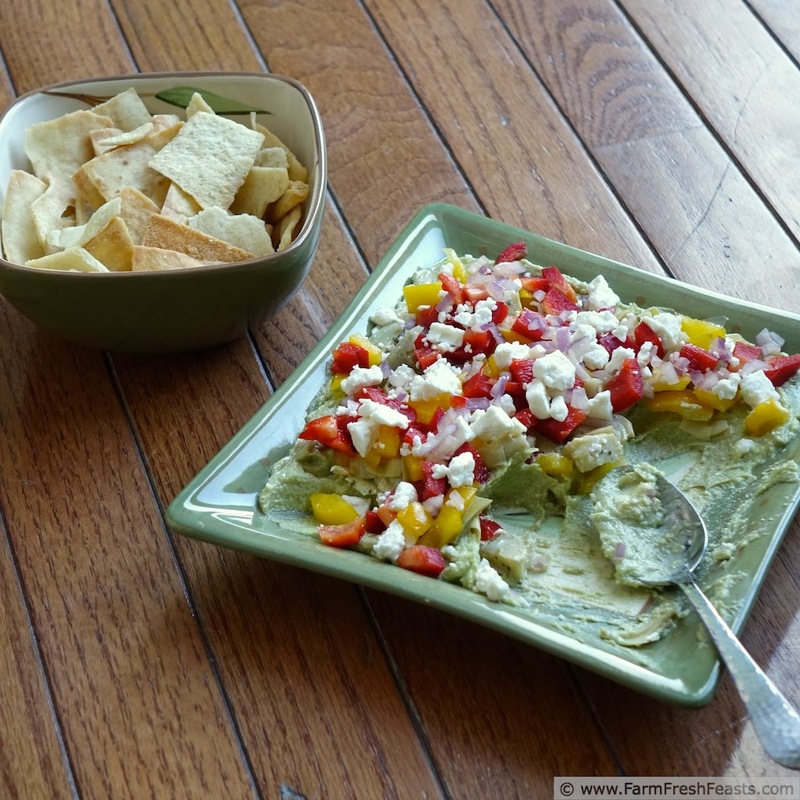 Reduce, reuse, recycle: I took one photo for both avocado dips. Ignore the cumin and chick peas for another month. Combine everything in a food processor and pulse several times until smooth. Enjoy as is, or spread on a flat plate, layer additional vegetables (bell peppers, pickled peppers, chopped olives, chopped onion, marinated artichoke hearts are some of my favorites) and additional feta cheese, and finish with a drizzle of olive oil, if desired. Like the Clickable Collage? Me too. I made a whole page of them. For more recipes using avocados, please see my Avocado Recipes Collection. This is part of the Visual Recipe Index by Ingredient, a resource for folks like me looking to add more avocados to their lives and not just wanting guacamole 24/7. It gets the bed messy for one reason. If you'd like more recipes follow me on Pinterest. If you'd like more interesting reads about food, agriculture, and things that catch my eye follow me on Facebook. If you think 4 second videos of Basset hound ears flying on a windy walk are adorable, by all means follow me on Instagram and I'll do my best to make you smile. Want to know How to Use This Blog? I love this. I also love dips layered with veggies and eaten with more veggies and chips. The second picture with the banner is spot on. Beautiful. Can't wait to try it. I love this, too. So much that the slight variation is already on the schedule for next month! And thank you--I was covering up Melanie's floor mat with that banner! This is all of my favorite non-chocolate things, all in one place. I think I need this in my life ASAP. You and me both! I'm out of avocado--must remedy this situation soon! I love, love this recipe! It sounds so good that I'm afraid I would eat the whole batch myself. :) Thanks for sharing Kirsten! I cannot tell you how many times my solo supper last summer was a similar dip, topped with fresh veggies and cheese and eaten with a spoon. It makes a delicious dinner! I could surely eat this dip with toast for breakfast every morning. Now that you mention it, I could easily eat this for breakfast. Or dinner. Or Brinner. I'm easy that way. And once you've consumed a pile of veggies for breakfast it makes getting enough 'enough' veggies over the course of the day a piece of cake! I would be just eating this with a spoon, so good! Thanks for linking up with What's Cookin' Wednesday! When I ran out of pita chips, I shook the crumbs out of the bag (croutons! it's a Feature!) and ate this sort of thing with a spoon. BTDT, you'd be in good company.